Lil' Blog and More: Newest Winner! 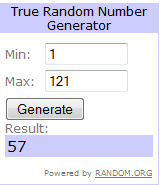 Congrats to the winner of the Roundabout Cupcake Sleeve Giveaway! Congrats, and good luck to everyone in the future giveaways! Hey sweetie its me Misty Pretty-Pink-Diamonds, can you please update my button somehow it got moved in my photobucket.